We recently got back from a trip from the gulf. It was a trip that was long overdue. We had lots of rest and relaxation, as well as lots of great seafood. The food down there was something I could never get sick of, especially the shrimp. Since we have been back home for a couple of weeks, that shrimp was still on my mind. So as I normally do, I began purging items from our freezer and noticed a big bag of whole shrimp. I was stoked to say the least and knew exactly what I was going to make with them. Chinese walnut shrimp! I can’t say this would be a dish that I would order at a Chinese restaurant but one I know that my wife loves and has talked about in the past. 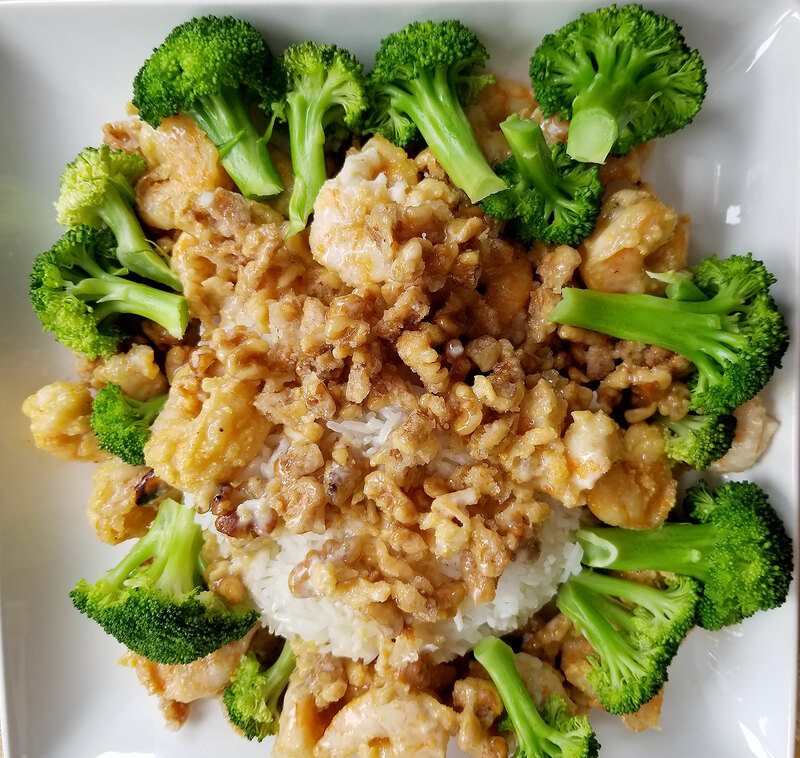 It was time for me to step up and impress my wife with this simple, and really tasting Chinese walnut shrimp. The kicker is the sauce, and trust me you will love it. The oil that will be used to crisp up the walnuts will be reused for the shrimp, so don’t discard it. You will want to start by heating your oil on medium heat. As the oil heats, go ahead and make a simple syrup. Heat another small pot on medium heat and add the water and sugar. Bring that to a simmer, then remove it from the heat. The oil should be heated now. Add the walnuts to the oil and cook them for a few minutes. Just be careful as you do not want to burn them. After a few minutes, remove the walnuts with a slotted spoon and place on a paper lined plate to remove any excess oil and season with salt. Once the walnuts are strained, add them to the simple syrup and and give that a good stir, coating all of the walnuts. Add them to a parchment paper lined tray, and try to keep them from sticking together. Set aside. Next, make your sauce. Add the mayonnaise, vinegar, condensed milk, honey, and salt to a mixing bowl, and stir well. Set aside on the counter. Now to the shrimp. Reheat the oil to about 350 degrees. During this time, add the shrimp to the cornmeal (or cornstarch), and toss them around to make sure they are full coated. Once the oil is heated, take a few shrimp, enough to not crowd the pan of oil, and shake off any excess cornmeal, and gently drop them into the oil. Cook the shrimp for only a few minutes as you want crispy, succulent shrimp. Place the cooked shrimp in a mixing bowl, season with a bit of salt, and repeat this process until all shrimp are cooked. Cook your broccoli in boiling water for about two minutes, then blanch them in cold water. Strain and set aside. Add the sauce to the bowl of shrimp and gently stir, coating all of the shrimp in that delicious sauce. I like to add cooked rice to a bowl, pack it in, then flip the bowl over onto a large serving plate. Pour the shrimp over the rice, then garnish around the rice and shrimp the broccoli. Pour over the candied walnuts, and now you are in business! My wife, who did not know I was making this dish was floored and fell in love with it. Real deal is what I think I heard her say, but regardless this had me sold. And that shrimp… oh yeah that shrimp was something to write about. I hope you enjoy!